I was reminded of something very important this week. It happened while reading Q is for Duck, with a charming 2nd grade girl. 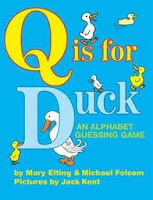 The book matches each letter of the alphabet with something that begins with a different letter and asks the question, "Why?". The subtitle tells us it is an alphabet guessing game, and guess she did. She came up with some great guesses to connect the given letter with the animal on the page. They were every bit as good as the answers the author chose. I watched her disappointment when she turned the page, and read a different answer than she gave. I think kids get used to being right or wrong, so it was important to me to help her understand that her responses were different than those chosen by the author, but they were not wrong. She was thinking so hard that I could practically see the wheels turning as she thought of words that would work. Here are some of her guesses. B is for dog. Why? The author chose bark. My young reader chose best friend. F is for bird. Why? The author chose fly. My young reader thought of flap because a bird flaps its wings. G is for horse. Why? The author chose gallop. My young reader picked giddyup. M is for cow. Why? The author chose moo. Both milk and mammal were my young reader's good suggestions. I applaud this young lady's creativity and am glad for the lesson she taught me while I was tutoring her. So true. S loves to give the right answer to and we've had to deal with this idea of multiple right answers. Hello! I LOVE your blog! I am a newbie to blogging so I am nominating you for the Liebster Award! Please come over to my blog and check out the requirements! Congrats! Welcome! We are thus excited to suit your needs!! This is likely to be your time and effort! I simply comprehend it!